There is no better place to spend Valentine’s Day than in Paris. Paris as we call, the city of love, has an abundant amount of romantic locations. Take your loved one to celebrate this Valentine’s day in Paris and discover the romantic sceneries Paris has to offer. 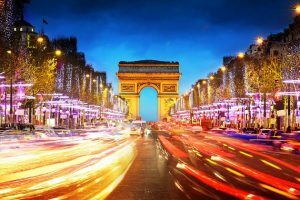 ParisByM has created a list of five great places in Paris to celebrate with your significant other. 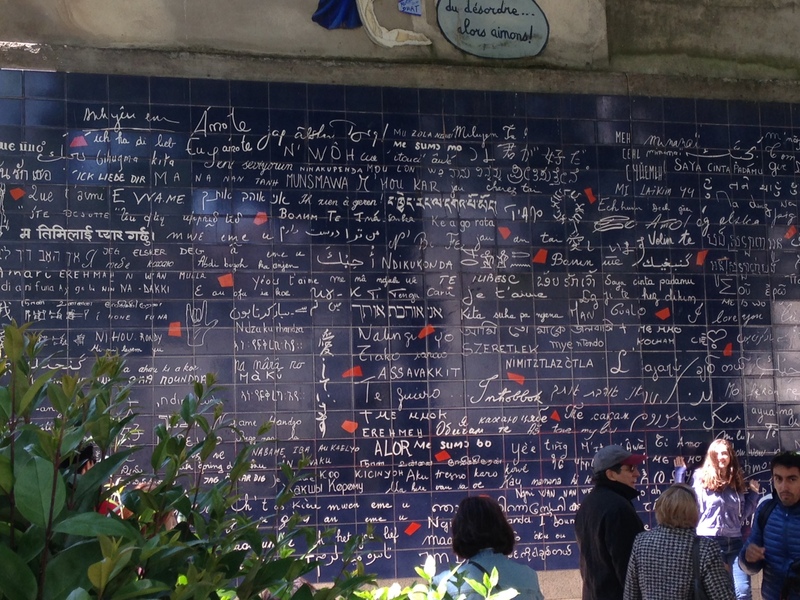 The Wall of Love is located in the 18th arrondissement in the historically artistic hill of Montmartre. 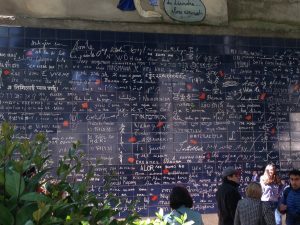 The wall consists of 250 different languages on how to say “I Love You”. This is the perfect place to take your loved one and express your love in 250 languages. 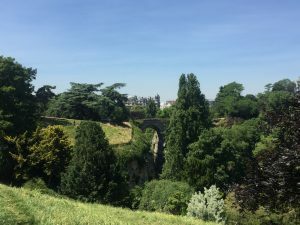 After, take a nice stroll through the neighborhood to discover the romantic scenery and the artistic influences where Van Gogh created his Montmartre collection while he lived there with his brother in the mid-1900s. 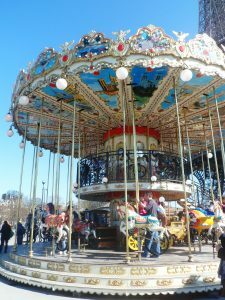 Spend some time at the Montmartre gardens and make memories or take a ride in the carousel to spice up your love scene. 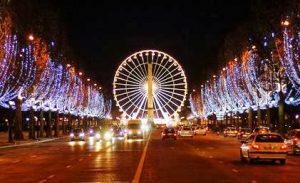 Enjoy the view from the 100 meters tall Ferris Wheel located in place de la Concorde, where you have a good view of the Eiffel Tower, the Luxor Obelisk, the Louvre and the Arc de Triumph. Take a trip around the wheel with your sweetheart to spend a brief one-on-one time with your sweetheart while enjoying the view. With the wind blowing in your hair, the bright lights, and the height to set the perfect mood to kindle some emotional feelings. Sure, it might seem to be a cliche, but don’t miss out on one of Paris’ most romantic activity. The Seine dinner cruise is a relaxing moment with the combination of a glamorous dinner and an attraction tour. The bright lights and sound of the river create the perfect ambiance for your ideal night. There is no better way to spend a magical Valentine’s day evening than eating delicious food on a cruise with a view and with your beloved one. After, visit the Pont des Arts, also known as Passerelle des Arts. 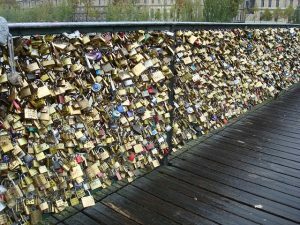 It is a pedestrian bridge crossing the Seine river where lovers come with locks to create love promises. They carve their initials in the locks and secure it to the bridge to assure a long-lasting love and a memory to reflect on. Note that we do not recommend to do the same and attach your lock to the bridge fences, as this poses problems in terms of security (imagine the weight of dozens of iron locks sweeping away a portion of the bridge and collapsing on someone’s head while a boat is passing underneath…), but you can find other places to “enchain your love“! For the nature lovers, visit this beautiful park this Valentine’s day and explore the beautiful setting. 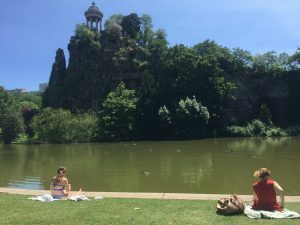 Spend loving time by the waterfall and have some deep conversations or have a make-out session at the Temple de la Sibylle, on top of the hill. This temple is the miniature version of the famous ancient Roman Temple of Vesta in Tivoli, Italy and has been an inspiration for plenty of romantic paintings in the seventeenth to the nineteenth century. 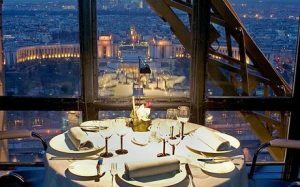 The perfect Paris Valentine’s day experience won’t be complete without mentioning the notorious dinner on top of the Eiffel Tower. As common as it is, it is still considered one of the most romantic locations just right for Valentine’s Day. The view of the city from up there is just magnificent and is definitely a must for all couples. Dinner on top of the Eiffel Tower is extremely popular and it gets booked quickly, therefore, we suggest booking early even before arriving in Paris. Although the restaurant on the 2nd floor is that of the famous chef Alain Ducasse and its exceptional location and the quality of the menu are reflected in the price, you also have the option to dine on the first floor at the more affordable traditional restaurant and still share the experience of dining on the Eiffel Tower on Valentine’s Day (booking a few months in advance is still recommended).